Ships Today if ordered within 0 hrs and 8 min. Note: Size for manual measurement, there may be a 0 to 1 cm error, belongs to the normal phenomenon. 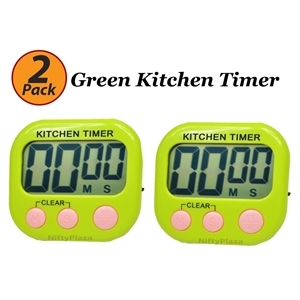 100% brand new and high quality, Large, Clear Digits, High Quality Materials, Digital Kitchen Timer brings simplicity to time keeping for a wide range of uses, Designed with user-friendly functionality, the timer offers both quick countdown and count up operation. Pause at any moment of operation without the concern of inaccuracy or distractions. Whether affixed to any magnetic surface with the use of the included back magnet, or conveniently placed on a table-top with the pullout stand, the large LCD display is clear and easy to read. The timer also includes a hook for hanging when magnetic surfaces and tables are not available for use. No matter the application, the food timer allows easy hands free placement to allow quick timing convenience. It is small and compact for easy storage and portability. Most importantly, the alarm is loud and easy to hear from another room so baked goods can never be burnt again. Whether used at a solon, track field, or kitchen, The Etekcity Digital Cooking Timer delivers reliability for perfect timing. 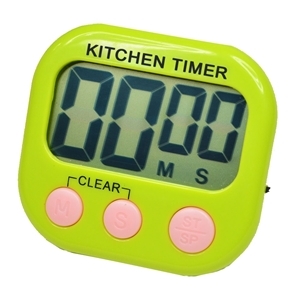 Timer can count up and down so can be used as a stopwatch as well as a countdown timer, ideal for cooking food, homework, workout, sports, games, time out (for kids), office and classroom activities. Press S or M Button to set the second or minute; Press ST/SP button to start/stop the timer; press M button + S button at the same time will RESET the time to 00:00. When Countdown finished, the Timer will ring "Didididi....Didididi..." to remind you! Press any button to stop the ringing Loud, Audible Alarm, Can Hear From Another Room Magnetic Backing and Retractable Stand, Memory (remembers last setting used): Press ST/SP button will RESET to last setting used The maximum time set is 99 minutes and 59 seconds. If the alarm is not stopped manually it will continue to sound for 1 minute, The timer will remember the last setting, which is useful for repetitive activities.